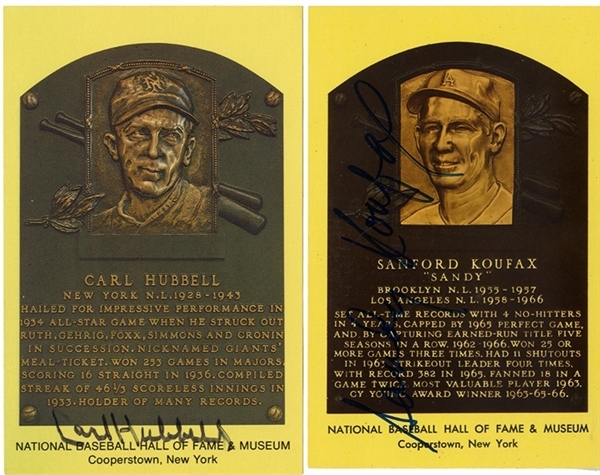 Two (2) Hall of Fame Signed plaque photos, includes: Sanford “Sandy” Koufax (b. 1935) is a former American Major League Baseball (MLB) left-handed pitcher. He pitched 12 seasons for the Brooklyn/Los Angeles Dodgers, from 1955 to 1966. Koufax, at age 36 in 1972, became the youngest player ever elected to the Baseball Hall of Fame. and Carl Owen Hubbell (1903-1988), nicknamed "The Meal Ticket" and "King Carl", was an American baseball player. He was a member of the New York Giants in the National League from 1928 to 1943. He remained on the team's payroll for the rest of his life, long after their move to San Francisco. Twice voted the National League's Most Valuable Player, Hubbell was inducted into the Baseball Hall of Fame in 1947. During 1936 and 1937, Hubbell set the major league record for consecutive wins by a pitcher with 24. He is perhaps best remembered for his performance in the 1934 All-Star Game, when he struck out five of the game's great hitters in succession. Hubbell's primary pitch was the screwball.